My five year old does not like cup cakes. Her friends consider her “weird”. Chances are they have never encountered another person who does not get excited seeing the fluorescent colors and the Nick Jr. themed toppings . Birthdays are for cakes and cupcakes, but my little one stresses out before going for a party because she will have to have a cupcake with icing on it. She also does not want to offend the friend by saying no to a cake. While the other kids are licking off the icing from gorgeously decorated cupcakes in a party, she sits with a sullen face waiting for the icing to be wiped off clean. However, I do feel good (and a little proud too) when she announces with a child’s honesty that she likes “mama’s cakes are the best”. Mama could be the most inexperienced baker, but my baby sees it quite differently. Mama listens to her and does not use any icing or frosting. The farthest she will go with an icing is a light citrus drizzle or a thin drippy chocolate ganache. I have to say that her tastes are more like grown ups. A few days back while we were spending some time together, she asked me if I could make some muffins for breakfast and “with lots of nuts” and “no chocolate”. Considering the fact that muffins are “Ugly Cupcakes” – plain, brown and with no decorations, they are perfect bite sizes for her, just the way my baby likes it. She shares my obsession with the citrus flavor and readily agreed when I asked she wants anything with nuts and oranges. So here is the muffin inspired by my little one. We actually baked them right away. On a quite different note, it just happened to dawn on me that this blog has become my journal. I do not keep a formal journal and I always wished I did. This recipe probably would have been repeated time after, but if I did not write down how this little thing inspired me to bake this today, maybe a year later it would have been all forgotten! This space has become such an important part of my life and for my family too. Some day, when my kids are all grown, they will flip over the pages of the memories and might share a laugh or a moment to ponder about. This is a fairly easy recipe and perfect to bake with the kids. The ingredients are not too many and they really enjoy measuring and the minimal mixing that it requires. My daughter’s favorite part was placing the almonds on the batter filled cups. She did it very carefully making sure it was right in the center and exclaimed that the whole nuts make the muffins really “pretty”. I have used Olive oil here, but any oil you prefer to bake with will do. The orange may be substituted with any kind of citrus flavor/zest and juice. I have used almond meal along with some flour, which may be substituted with all all purpose flour too. I ran out of the regular black poppy seeds used for baking, so I used the white one. They have the same crunch, but they don’t show up looking pretty once baked. I have to mention here that the texture of these muffins are not smooth. Because of the use of the nut flour, the coarse nuts and the poppy seeds, they are a moist but a tiny bit crumbly. 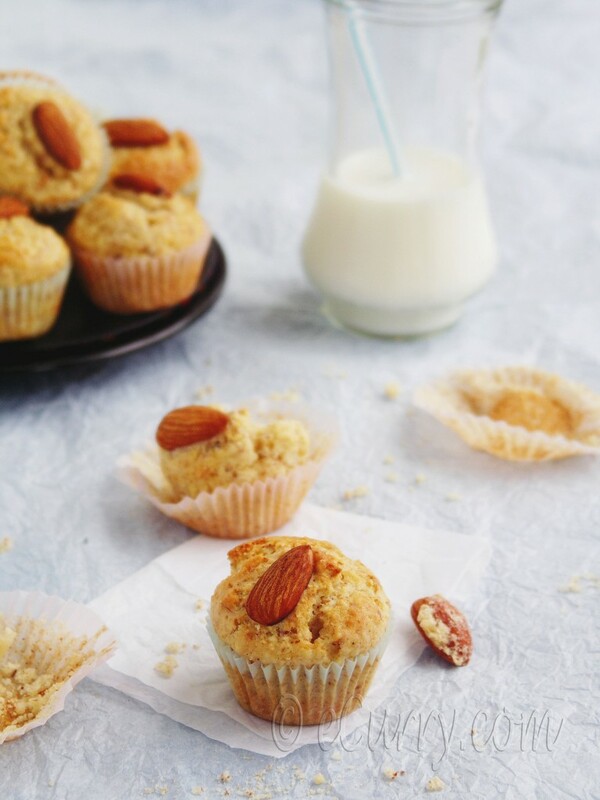 We really like the wholesome feel of these muffins. 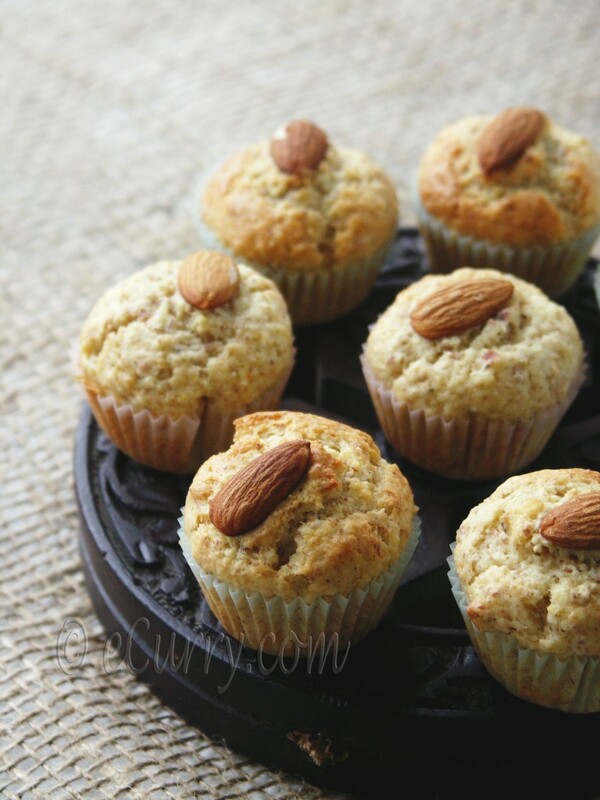 Some whole almonds or slivered ones to top the muffins. Whisk together the wet ingredients: the egg, milk, juice, oil and almond/orange extract or blossom water. In another bowl, combine all purpose flour and orange zest. Rub the zest into to the flour with your finger tips. Combine the rest of the dry ingredients: almond meal, sugar, baking powder, nutmeg, salt and chopped/slivered/coarsely almonds. Mix the wet and the dry ingredients with a wooden spoon. The mix will be thick and sticky – not runny. Spoon batter into lined muffin cups – each 3/4 filled. 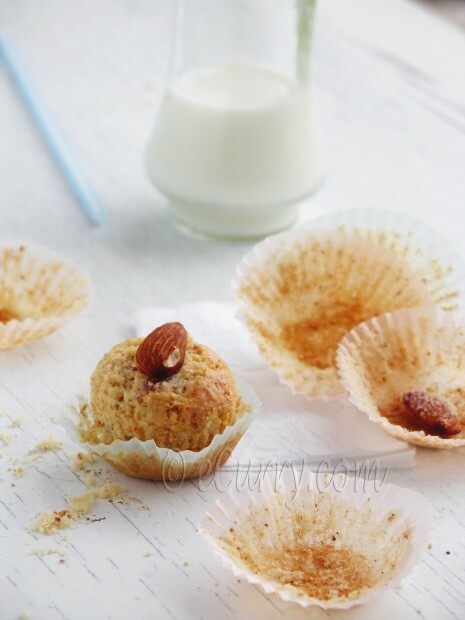 Place one whole almond (or sprinkle a few slivered ones) over each batter filled muffin cup. Bake at 375 F for about 15-18 minutes or until a toothpick comes out clean and the top of the muffin is golden brown. 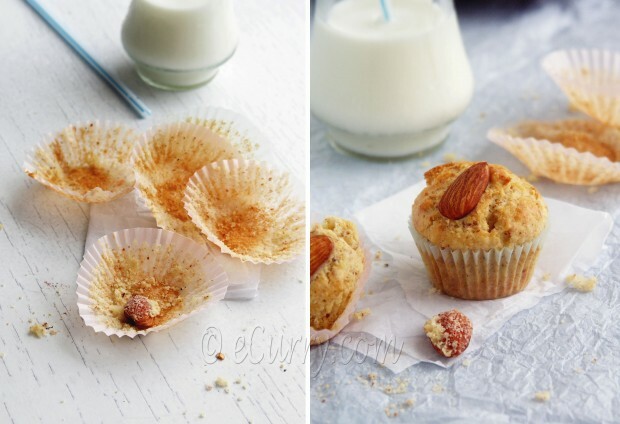 Cool muffins for 7-10 minutes. 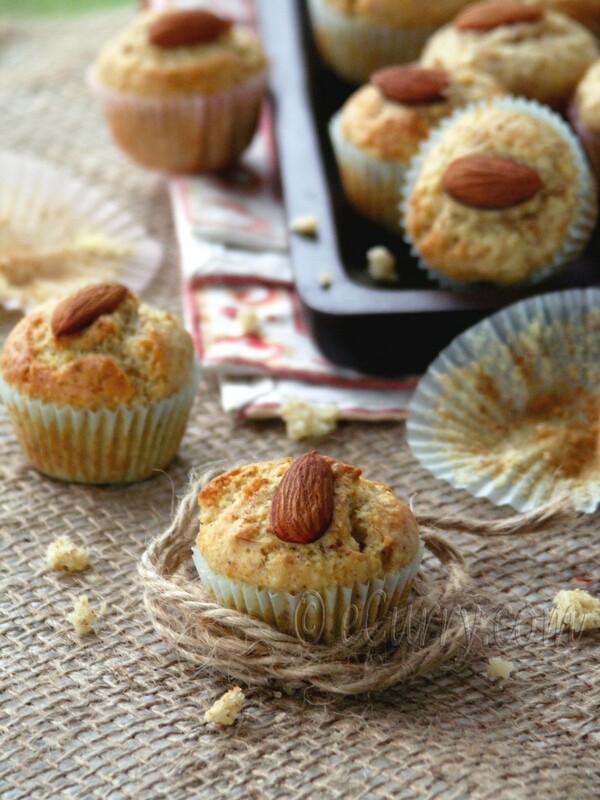 Enjoy these tiny nutty zesty muffins for breakfast or any time snack. They are fluffy and light, but with a wholesome nutty bite. And did I tell you before that we LOVE using orange and the zest in out food? The citrus flavor makes everything so much more refreshing. Reg li’l one,I feel to hug her so much that she is a baby of ‘character’.The fact that she dislikes the cream,I don’t know but I have some vibes here..Loved her comment on Mamma’s baking.I have a 6 yr old here who opines and extremely proud to state that she loves what Mamma makes.That’s definitely something to be proud off. Above all,what your lill’ one declares is a perspective she obtained from what she had been lucky for..Mamma who cooks & bakes with passion..Salute you Proud Mamma there..
Forgot to say,I love all your ravishing clicks here. Those muffins look marvelous and so delicious! These photos make it so hard to behave on my ‘extend my shelf life’ diet. I will have to settle for being inspired by your lighting, styling and composition and how enticingly you present it all in your postings. 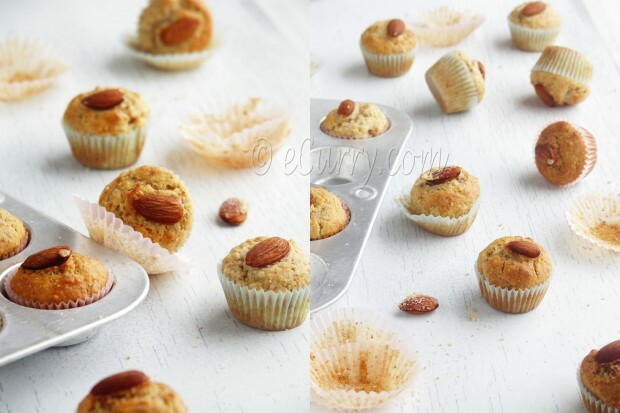 These muffins are cute little beauties….& I’can taste the flavors….guess how ? ?I just finished my breakfast & had similar kind of mini bundts I made yesterday but no toppings of whole almonds & no poppy seeds here instead some black raisins…..I don’t use poppy seeds in my cooking/baking & now I’m thinking of trying them in some muffins(have some in the pantry)…. Love your lil’one for her taste….my 2&1/2 yr. is perfect icing cleaner she’ll leave the cakes/cupcakes intact & just licked off the icing…..& yes it the best moment of your life when your kids declare that mommy bakes best…. wow, so cute and lovely, absolutely mouth watering. Muffins may be the ‘ugly cupcake’ but I will always prefer these to a heavily frosted cupcake! I like her taste 🙂 The flavor combination of orange and almond always sounds yummy to me and the design she did ..right is the center is so cute 🙂 Gorgeous click as always!! I’m like your daughter. I never liked cakes and I especially never liked frosting. Crumbly, wholesome muffins on the other hand sound absolutely delicious to me. I’ll have to make these for breakfast someday soon! You little one is adorable more for the fact that she dislikes the useless icing. These muffins are so darn cute and oh so doable. You call yourself a novice baker and work wonders. Imagine if you were a very experienced one what amazing creations you’d be coming up with. You know, I don’t like frosted cupcakes either. Sometimes I’ll use whipped cream or mascarpone. And when I was little, I actually didn’t like sweets either. And hated chocolate! Your little one sounds so sweet and adorable. And ‘her’ cupcakes/muffins sound really, really tasty indeed. Soma, Your five year old is just too adorable and you should be proud, has a mind of her own. Tell her I don’t like cupcakes either and if I must have a slice of birthday cake I eat it from the bottom. Muffins look fantastic!! what a compliment from your daughter (and to your daughter, by the way, for standing out from the crowd). i love cooking with orange blossom water, and always add citrus zest to my baked goods. i will definitely try your recipe since i’m aiming to bake more with almond flour. they look beautiful! Good for you. I do think it is a little strange the way we are all supposed to faint over chocolate and cupcakes. Personally I think there are superior tastes and your daughter has a discerning palate. Long may it last – and while you are cooking up such fabulous treats, I’m sure it will. Awww.. that is so sweet. Their innocence and honesty just melts our hearts. Our 5 year old is the same and does not like frosting or nuts. He loves anything with “Chlocate”. Love this flavor of muffin which has orange flavor in it. Oh high five to your five year old! I hate cupcakes as well and just don’t understand what the big deal is with them. These little muffins are decidedly more to my taste. These are absolutely delicious! They were a great success at our family Easter dinner. My daughter is three and had a fabulous time adding the ingredients and placing sliced almonds on each muffin.